1. 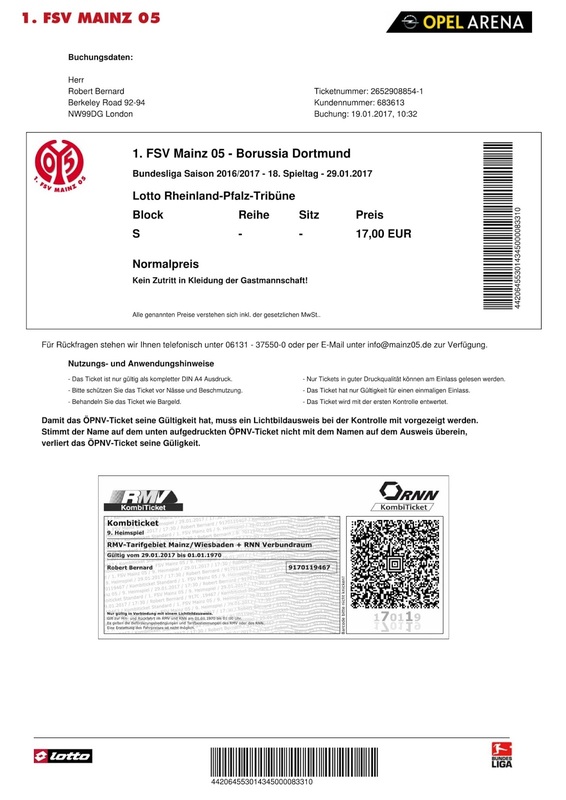 FSV Mainz 05 is a professional football team from the city of Mainz, which is located in the German state of Rhineland-Palatinate, on the opposite side of the river to Frankfurt. The football club was formed in 1905. An attempt to set up a club had failed in 1903, but two years later 1. Mainzer Fussballclub Hassia 1905 was formed, playing their football in Süddeutschen Fußballverband (South German Football League). A merger took place with FC Hermannia 07 to form 1. Mainzer Fussballverein Hassia 05. In 1912 the club shortened its name to Mainzer Fussballverein 05. Anorther merger took place in 1919 with Sportverein 1908 Mainz to become 1. 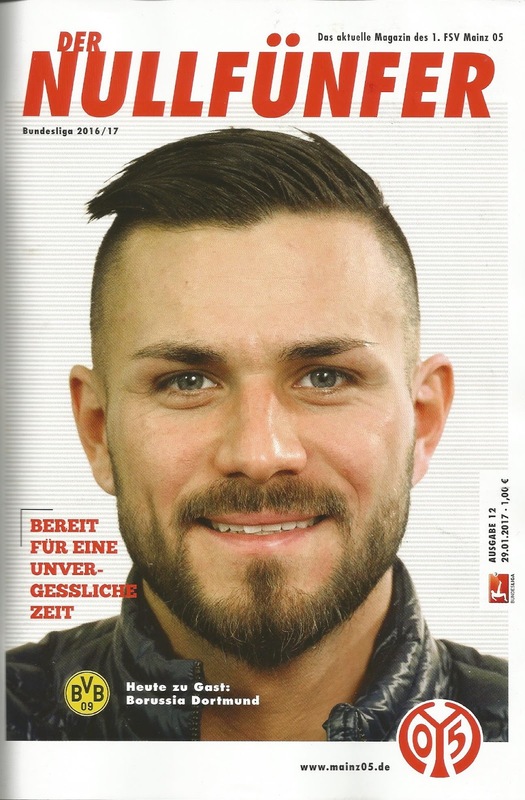 Mainzer Fußball- und Sportverein 05. The club won several regional titles as well as Kreisliga Hessen in 1921. In 1928 Stadion am Bruchweg was opened as Mainz found a new home. 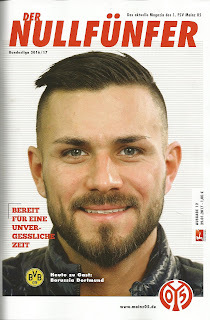 “Die Nullfünfer” (0 5’s) won Bezirksliga Main-Hessen in 1932 and 1933, and were placed in Gauliga Südwest, one of sixteen top flight divisions put in place in Germany under the rule of the Third Reich. Karl Scherm banged in the goals for Mainz, but they were relegated after just one season. 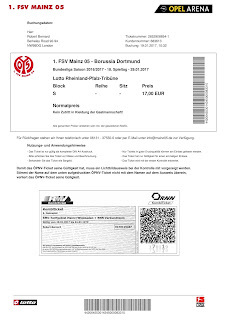 A further merger took place in 1938 with Reichsbahn SV Mainz, with the club taking on the title Reichsbahn SV Mainz 05 until the end of World War Two. Following the war, Mainz resumed in the Oberliga Südwest, one of several top tiered divisions at the time. The Bundesliga was formed for the 1963-64 season. The second tier Regionalliga operated with five regional divisions. Mainz were place in Regionalliga Südwest. A third place finish in 1965-66 meant the club just missed out on the promotion play offs, but they did qualify in 1972-73 when they lifted the league title. However they finished third out of five in the promotion group, so they remained in the Regionalliga. Another decent finish the following season earned the club a place in the newly formed two section 2. Bundesliga for the 1974-75 season where they took their place in the south division. Despite a mid table finish in 1975-76, Mainz voluntarily gave up their license and were relegated to Oberliga Rheinland-Pfalz/Saar. In 1980-81 the team won the league title and went on to be crowned as the amateur champions of Germany. Further Oberliga Rheinland-Pfalz/Saar championships followed in 1987-88 and 1989-90, with promotion being sealed back to 2. Bundesliga on the second occasion. Mainz struggled once back in the second tier until head coach Wolfgang Frank brought in a system that worked for a team including Jürgen Klopp and goals from Thomas Ziemer, Abderrahim Ouakili and Sven Demandt as the side just missed out on promotion in 1996-97. Gustav Policella was the top scorer as Mainz pushed on. Eckhard Krautzun was the manager of the time, until he was replaced by Klopp when he retired from his playing career in February 2001. Klopp’s side managed to save themselves from relegation to begin an upturn at the club. After just missing out on promotion for two seasons running, Mainz reached the top flight Bundesliga at the end of the 2003-04 season after a third place finish with Michael Thurk contributing to the goals tally. The team won a place in the UEFA Cup for their fair play in their debut season but the team were relegated in 2006-07. In May 2008 Klopp left to take over as team boss at Borussia Dortmund. Jørn Andersen arrived in his place and led Mainz back to the Bundesliga in 2008-09 as Aristide Bancé finishing as top scorer. Thomas Tuchel was appointed as head coach for their return to the top flight, with the team finishing in fifth place in 2010-11 with Nikolče Noveski as captain and Ádám Szalai the leading scorer. The brand new Coface Arena opened on the outskirts of the city in 2011 with a larger capacity and facilities. Mainz continued to establish themselves in the upper echelons of the Bundesliga aided by the goals of Shinji Okazaki in 2013-14. Tuchel stepped down as manager in May 2014 to be replaced by Kasper Hjulmand. However, the Dane only lasted until February 2015 when the Swiss Martin Schmidt took over. He led the side to a mid table finish. Julian Baumgartlinger captained the side to a seventh place finish in 2015-16 with Yoshinori Muto a regular scorer. A new sponsorship deal in the summer of 2016 saw the renaming of the stadium to the Opel Arena. 1. 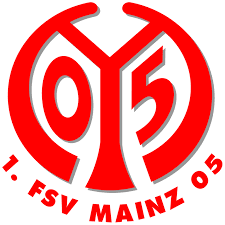 FSV Mainz 05 will play in the Bundesliga in the 2016-17 season. My long weekend in Germany had hit its fair share of travel problems for the first couple of days, but fortunately all was going reasonably well on the third day. I’d got back from the Wildparkstadion in Karlsruhe after the home teams game against Arminia Bielefeld in decent time and grabbed myself some snacks for the hour long train ride back north. The times were tight for my second game, but they were the best I could do. The IC Bahn service was bang on time, arriving just twelve minutes before the scheduled kick off. I quickly got off and found the left luggage lockers straight away. Within a couple of minutes I was in a taxi and heading to the match. A home fan was also obviously late and when we stopped at the lights he looked desperate for a lift. A mixture of sign language and my basic German saw him getting into the back of the cab. Our driver did a fine job and we pulled up with just a couple of minutes of the game gone. My new pal went half on the fare so I was more than happy. Just as I went through the turnstiles I heard a muted roar. The TV’s on the concourse told the story. The Mainz defence had gone on walkabout following Pierre-Emerick Aubameyang, allowing Andre Schurrle to set up Marco Reus to score for Dortmund he were being led by former home boss Thomas Tuchel. At that point I decided to make sure I bought a programme before going upstairs onto the terracing behind the goal. As the game was sold out it was always going to be a struggle to get a good place when arriving late. Stewards were doing their best to keep the aisles clear. I went right to the back on the flat standing to try and get a view. The Opel Arena was a typical modern build, but it was attractive. The four stands were enclosed in the corners to keep any wind out. The main side was to my left with the usual corporate facilities. Apart from our end and a section for visiting fans in the far corner, the rest of the ground was all seated. I did my best to see all the pitch but it was proving difficult. Jonas Lossl in the home net was fortunate not to concede a second goal before the break as he totally misjudged a through ball. He got lucky as Aubameyang couldn’t score into an empty net from a tight angle. When the referee blew his whistle for half time I grabbed my opportunity. Many fans looked to respond to their call of nature or to pop off for a beer or sausage. I grabbed a good spot right by the fence down the side a dozen or so steps down from the back. The second half was so much more enjoyable once I was in a comfy place. The home fans started to get behind their side as they kicked towards us. Dortmund were the far classier team, but Mainz dug in. Schurrle volleyed narrowly wide and had another effort saved by Lossl. The game became a midfield battle with few chances either way. Seven minutes from time 05’s Levin Oztunali crossed to the far post where Danny Latza headed home. Pablo De Blasis nearly stole all three points for Mainz with the last kick of the game, but he dragged his shot wide. The terrace began to empty apart from the loudest of the Mainz fans behind the goal, and I certainly didn’t want to hang around. While in the taxi before the game we passed a fleet of parked buses which I presumed were for after the game. I wasn’t sure where they departed from so I followed the crowds across the huge car park and then over some undeveloped land. A recently laid tram track gave me the impression that the area could be due for some building works. After about ten minutes I reached the main road through the crowds to the bus stop. I was soon on a special bus and back at the station. With forty minutes to kill before my train I went over the road for a couple of beers in a rough and ready bar. I was delighted and jaded when I got the train to Darmstädt where I was staying in the InterCityHotel. After a shower I was out and about again. My research had earmarked the Braustüb'l brew pub for a nice traditional German meal and sampling the local ale. Unfortunately they were closed on Sunday! My fellow groundhopping and beer aficionado pal Ken Stockhill had been around the same area all weekend without us crossing path. His knowledge proved invaluable once again when I texted him from the pleasant Gaststätte Die Theke. The bar was nice enough, but his suggestion would have topped the lot in many cities. I think Darmstädt was probably best summed up by the fact that the Darmstädter Ratskeller Hausbrauerei was the prettiest building I came across. It was an absolute cracker of a place with a really classy interior. The staff were also top class. Köln had been in town the previous day and hammered the home side 5-1. The amiable barman described his shift as “A bloody nightmare” despite him not being a big football fan. I think they may have been very busy! The bar kicked out at 1am which was enough for me as I had to be up early for the next morning for my train to Frankfurt and then Hanover. I let a taxi take the strain to get me back to my hotel. It had been a long but fantastic day.